"This is from Pancho's. It's really good." 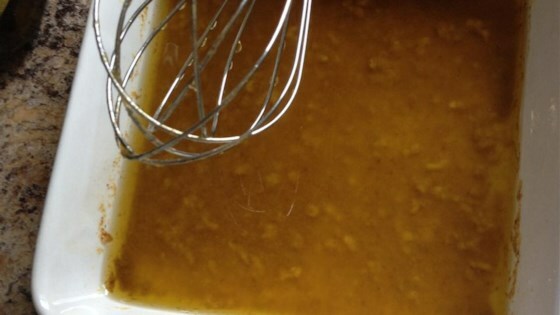 Whisk together the garlic, sugar, cumin, salt, mustard, cayenne pepper, and vinegar in a bowl. Whisk in the olive oil until incorporated. I wouldn't call this a taco sauce sorry, and there needs to be more seasoning in the mixture & waaaay less oil. oh my gosh, thank you soooo much. I love Pancho's taco sauce and I hate buying it in the store because it is costly compared to the amount we like to use. I'm going to try it tonight!! It took some adjusting. We like some spices more than others. But this recipe works great in a pinch. This is a fantastic recipe! I cut the oil in half and added some fresh lime juice, and then it was perfect. We use this on chicken taco bowls, and it makes it taste like a restaurant. Thanks!